Slice Eggplant in very thin, lengthwise slices. Bake at 350 for 10 minutes. Meanwhile, mix ricotta, parmesan, ½ of the mozzarella and the beaten egg. Spray a small lasagna pan and fill with 1/2 of a Jar of Sauce. Place 1 Tablespoon of the cheese mixture at the top of the large side of each slice and roll-up. Place seam side down in pan. 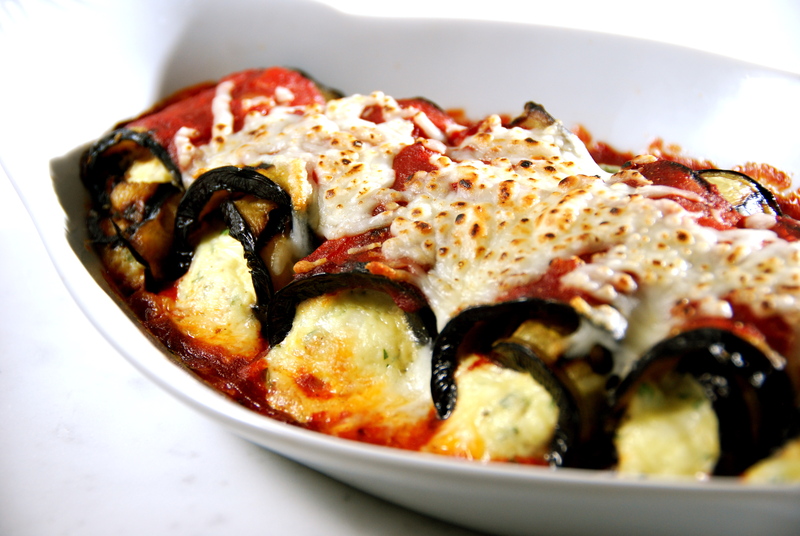 Spoon remaining sauce over each roll & top with reserved cup of Mozzarella Cheese. Bake at 400̊ for 20 minutes or until bubbly & melty.